KABUL, Afghanistan – An Islamic State suicide bomber targeted Afghanistan’s ethnic Hazaras on Friday, blowing himself up at a police checkpoint near a gathering of the minority Shiites in western Kabul, killing nine people and wounding 18, officials said. In northern Afghanistan, the Taliban assaulted an army outpost overnight in an hours-long firefight, and ambushed policemen sent to help the troops, killing six soldiers and 10 members of the local police. The attacks underscore the difficulties President Ashraf Ghani’s government is facing as it battles a revamped Taliban insurgency and struggles to rein in the Islamic State group, whose affiliate in Afghanistan has grown stronger since it emerged in 2014. Kabul has recently seen a spate of large-scale militant attacks by the Taliban and also IS. In late January, a Taliban attacker drove an ambulance filled with explosives into the heart of the city, killing at least 103 people and wounding as many as 235. In Friday’s attack, Basir Mujahid, spokesman for the Kabul police chief, said the bomber was on foot and was trying to make his way to a compound where the Hazaras had gathered to commemorate the 1995 death of their leader, Abdul Ali Mazari, who was killed by the Taliban. Shortly after the attack, President Ghani issued a statement condemning the bombing and promising that those behind it, if found and convicted, would be given the death penalty. The attack was intended to frighten Afghans but the perpetrators would not succeed, he said. “These people who do this are acting against humanity and against Islam,” he said. The Islamic State group, or the Khorasan Province as its affiliate in Afghanistan is known, claimed responsibility in a posting on an IS-linked website. IS said it targeted a gathering of Shiites as they were commemorating the death of a “tyrant,” an apparent reference to Mazari. Local Hazara leader Mohammad Mohaqiq told the Kabul gathering the explosion was an attempt to terrorize Afghans. Most Hazaras are Shiite Muslims, and Sunni militant groups consider all Shiites heretics and urge followers to kill them. The spokesman for the Health Ministry, Wahid Majro, said several of the wounded were in critical condition and feared the death toll could rise further. The overnight Taliban assault in northern Takhar province took place in a remote region of the district of Khwaja Ghar. The insurgents launched a siege of an army outpost there, killing six soldiers and wounding five in a blistering, hours-long attack, Defense Ministry spokesman Dawlat Waziri said. The Taliban also ambushed members of the local police who were sent to assist the soldiers, killing 10 policemen and wounding nine, provincial police spokesman Khali Aseir said. Taliban spokesman Zabihullah Mujahid claimed responsibility for the assault late Thursday and the police slayings. He claimed the Taliban had inflicted a far higher number of casualties but the insurgents often exaggerate their claims. The report could not be independently confirmed because of the area’s remoteness. In central Ghazni province, the Taliban attacked a police security post late Thursday, killing four policemen, said Arif Noori, spokesman for the Ghazni provincial governor. Another five officers were wounded in the gunbattle, he said. 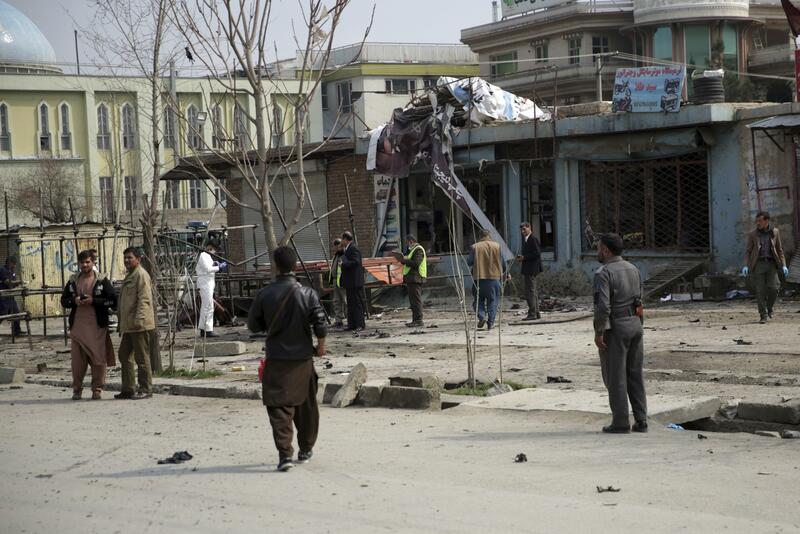 Mujahid, the Taliban spokesman, also claimed responsibility for that attack. Published: March 9, 2018, 8:32 a.m.